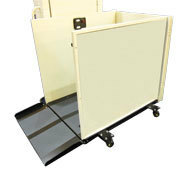 Harmar's Portable Package is the perfect solution for those that want the versatility and convenience to use a lift when and where they need it. A great solution for schools, theaters and churches. To A Business Without A Fork Lift Or Loading Dock $100. To A Residence With A Fork Lift $100. To A Residence Without A Fork Lift $200.